Mandalay, April 8: Indian women's football team will have their task cut out when they take on hosts Myanmar in a do-or-die Round 2 Olympic Qualifiers match here on Tuesday. India are on the verge of securing qualification from Round 2 with only the hosts standing in their way. The permutations and combinations are clear. Only a win for India will take them through to the next round of qualifiers, with only one team progressing from the Group A of Round 2 AFC Olympic Qualifiers. "We know it is a must win match for us. That is it. This is the big moment that we have all been waiting for when we started our preparation in December last year for the Round 2 qualifiers, and we aim to make it count," said India coach Maymol Rocky. Though level on points, 6 each, Myanmar have a goal difference of +8, as compared to India's +4 in the two matches played so far, which means it's do-or-die for India. 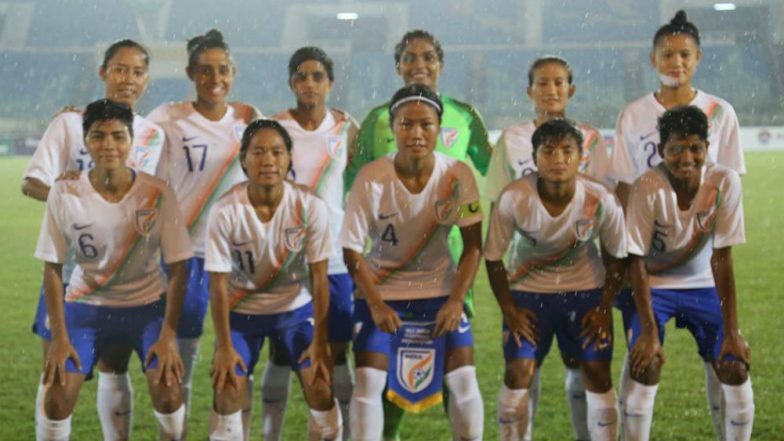 2020 AFC Olympic Qualifiers: Indian Women's Football Advances to Next Round Despite Losing to Myanmar. "We have always taken one match at a time. We will do so against Myanmar too. We are aware of the quality they possess. We will have to be on the top of our game if we are to secure qualification. We know what is at stake. The next 90 minutes have the power to define women's football back in India," Maymol said. "We knew this moment would come when the groups for the Round 2 Qualifiers were announced. We knew this would boil down to this -- India against Myanmar. In all our 14 international matches we have prepared keeping this scenario somewhere at the back of our minds," she added. She wasn't the only one to pre-empt it. Rival Head Coach Win Thu Moe of Myanmar, also lauded the Indian team. "India are very tough opponents. We played them in Hero Gold Cup, and they were difficult to break down. It is always hard to play against them and we know this moment would come where on April 9 we will be fighting it out as to who goes through," Moe stated. History seems to favour Myanmar. The last two encounters have ended both in Myanmar's favour, with Win Thu Moe's team winning 2-1 in Olympic Qualifiers Round 1 in November 2018, and 2-0 in the Hero Gold Cup held in Bhubaneswar, Odisha. But past is past. Striker Dangemi Grace declared "the girls are ready for Myanmar". "We know how Myanmar will play. We have had sessions focused on dissecting them. We are ready for them. The match is all about who wants it more," Grace expressed. "The last matches played against Myanmar were very close. We could have won them had we taken our chances. This time around we will make sure to capitalize on every mistake of the opponent." The nippy Ratanbala Devi highlighted the "crucial 90 minutes ahead". "These 90 minutes are the most crucial. We will make sure we leave no stone unturned in giving our 100 per cent. We have been preparing for this very moment, and aim to make it count," Ratanbala explained. Defender Sweety Devi believes "it will be more of a mental test". "We have already shown in all our matches that we are capable of putting immense pressure on our rivals. If we can score early, then we will have the advantage." Meanwhile, goalkeeper Aditi Chauhan has been ruled out of the clash against Myanmar following an injury.